MÖTLEY CRÜE singer Vince Neil was interviewed this morning (Friday, January 31) on the "Shmonty And Conklin In The Morning" show on 93.3 KDKB in Phoenix, Arizona. You can now listen to the chat using the audio player below. MÖTLEY CRÜE announced at a Los Angeles press conference on Tuesday (January 28) that the band will launch its "Final Tour" later this year, with the group planning to play 72 shows in North America in 2014 and more overseas in 2015. Making it official, the four members of the band had their lawyer draw up a formal "cessation of touring" agreement that goes into effect at the end of 2015 and prohibits the members of the group from going on the road again under the MÖTLEY CRÜE banner. 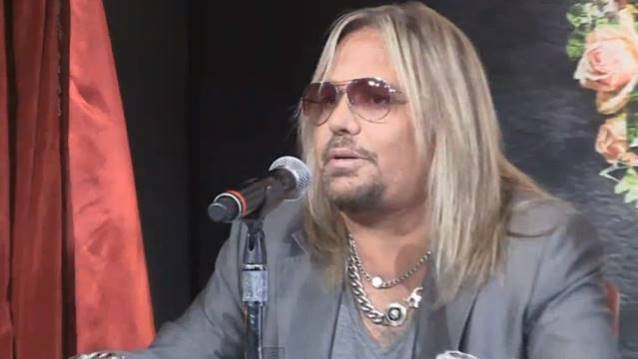 Asked if MÖTLEY CRÜE would ever consider coming out of retirement for a one-off show if the offer was high enough, Vince said: "Somebody just brought up that up. They go, 'OK, how about this? If a Saudi prince had a birthday party for his daughter and gave you ten million each, would you do it?' [And we wouldn't.] It's, like, everybody's looking for the loophole, for the gray area. We're done. "[Another thing] they said: 'If you're inducted into the Rock And Roll Hall Of Fame, would you get back together?' Probably so. But that would probably be it. I mean, there's no more touring." He continued: "Here's the thing: MÖTLEY CRÜE's not breaking up. We're still gonna be making music. We're still [gonna be selling] merchandise and stuff like MÖTLEY CRÜE things." Asked if the band will continue to record albums but just not touring in support of them, Vince said: "Well, probably not an album. We'll probably just make music — do songs for certain things. MÖTLEY CRÜE will still be around, we're just not gonna tour anymore. That's really kind of it." "The Final Tour" will kick off on July 2 in Grand Rapids, Michigan, with tickets for 60 of the shows going on sale Wednesday (January 29) to fan club members. VIP ticket packages were made available to the general public on Thursday (January 30) at 10:00 a.m. local time. The general public ticket sale for most shows starts on Friday (January 31). All tickets and packages can be obtained via Ticketmaster.com. In an effort to allow all fans a chance to see the tour, some ticket prices may be kept as low as $15 or $20. The special guest on the entire North American tour will be ALICE COOPER, marking the first time that the legendary shock rocker and the CRÜE will join forces live. The band will head overseas for the international portion of the trek in 2015.